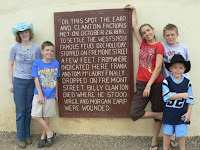 We left our hotel in Benson and headed south to Tombstone, AZ. 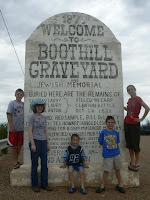 It only took about 45 minutes to get there and our first stop was the Boothill cemetery. The cemetery is free to enter through a souvenir shop and the people there are very friendly. You can get a brochure to help you walk through the cemetery and find the notable tombstones or notable people. The tombs of those killed in the gunfight at the OK Corral are there as well as the men hanged for the Bissel massacre. From there, we went into town and to the site of the OK Corral. You can only get to the actual site if you buy an admission ticket - we didn't. Besides, we were there early and they didn't have a show yet and we were looking to leave by their first show because of the special parade for the 4th of July. Better than any show, is walking through the town, it's like walking back in time - wooden sidewalks, old shops, original buildings, etc. This is one of our kids' favorite stops on our trip. From Tombstone we drove to Las Vegas, that's 505 miles of driving for the day and over 8 hours of driving. We got into Vegas, after a short drive into California so they kids could say they visited that state, around 6:00 pm. After dinner and getting settled in our hotel/casino, we caught their free shuttle to the Strip. We immediately headed down to Treasure Island to see if we could catch any of their out-front show. We caught the fireworks as the end. 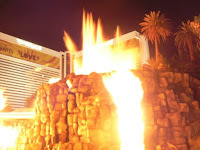 We then went back to the Mirage and watched their Volcano eruption. It was pretty good. We then tried to head back up to the Bellagio to watch the fountains. We got caught in the crowd (Las Vegas - Saturday night - July 4th) in front of Caesar's Palace during their fireworks celebration for the 4th. 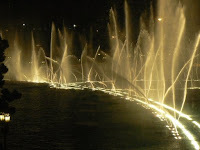 We finally broke through and got back down to the Bellagio and got to see fountains at night - what a show! Fighting our way back through the crowd to our shuttle bus stop (and onto our shuttle bus), we got back to our hotel and to sleep around 11:30pm. Overall, the kids were less than impressed with Las Vegas but the pressing crowds were overwhelming.